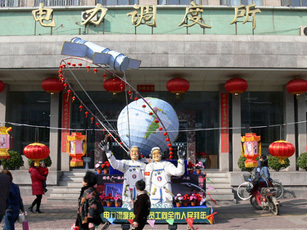 A float commemorates Shenzhou VI, China’s second manned space mission, which launched in 2006. AUDIO: Peter Ford of The Christian Science Monitor speaks about the sense of pride and achievement in China. As the United States curtails its space program, China’s funding continues to expand. Today, China launched the Shenzhou VII spacecraft — its third manned space mission — and will soon complete its first space walk. Watch a video of the spacecraft launch here, and an animated run-through of the entire mission here. “The Foreign Expert” posts an audio piece outlining the history of China’s space program and its role in the world. A resident of Guangdong blogs about the mission as a source of Chinese national pride on the heels of the 2008 Olympics. NASA astronaut Leroy Chiao posts about reopened space talks between the U.S. and China as well as the Chinese-made equipment used on the mission. China’s space program has been called a “growing threat” by the U.S. military, though NASA chief Michael Griffin today downplayed this idea and suggested China and the U.S. might collaborate in space endeavors in the future. Last week, the Council on Foreign Relations released a report entitled “China, Space Weapons, and U.S. Security” [PDF]. Yesterday, a Virginian physicist was arrested for illegally exporting space launch data to China. Photos courtesy of NASA and Flickr user drift_would under a Creative Commons license.